I have a post rumbling around in my head that I’ve hesitated to share. Who is this going to offend? Who is this going to inspire? I had planned to post 2 different pics of myself. One taken in January, one taken this week to show my fitness progress, change in body composition and weight. Maybe I really should post those pics because to really illustrate my point maybe you need to see that there is almost zero difference between the two. (Maybe in my IG stories) But I thought the pics themselves might take away from my point or even add some irony to my post. My weight in January was 141. I was lifting super heavy daily and running a little bit, but slow and easy Miles. I was counting my calories and watching my macros. My pic from this week showed me weighing in at 139 (and I’m pretty sure it was before lunch because I was surprised to see a 3 instead of 4). Currently I have been logging about 60-70 miles a week, in the heart of marathon training, and only lifting light weights a few days a week. I’m not counting calories but just eating nutritious foods, focusing on intuitive eating and fueling my body for the long miles. In the broad spectrum of things, let’s argue that my weight pretty much stayed the same. My appearance and size: same. My pants fit me….the same. Six pack? Eh….barely, if I really squeeze and scrunch up my face like something smells really bad. But still…the same. So, what’s my point? The point is this: fitness, health, exercise, nutrition, whatever you want to call it. It’s not about what you look like. Or about the number on the scale or about your pants size or about getting a six pack. Those things mean nothing long term. It’s about movement. It’s about taking good care of the body you were blessed with. The only body you get. Its about pushing your limits and seeing what you’re capable of. And then pushing a little further. It’s about finding joy in this crazy thing called life. It’s about climbing mountains, and seeing the world. It’s about playing with your kids. It’s about having energy to go swimming or hiking with your grandkids. It’s about longevity. I want to be still doing this when I’m 80. I don’t think I’ll care much about having a six pack when I’m 80. But I hope I can still get out and walk or hike or dance or play! So whether your choice of movement is running, hiking, biking, lifting, or under water basket weaving, it doesn’t matter. Just get out and do it. Move your body. Enjoy your life. And just go head and throw away that damn scale! Ok I’ll be brief because it really annoys me when I go to a website for a recipe and the person posting it has a 400 page essay before they share the recipe. But, I’ll just say one thing. I LOVE that berries are in season! They are my favorite! So since we have raspberries coming out our ears from our backyard bush, I get inspired to make a Cobbler with the berries on had on hand last night. Put all ingredients in 9×13 pan and put in oven, mix as it melts about 10 minutes. Remove and separate 1/3 of mixture and place in bowl, set aside. Press the rest inside the pan. Spread fruit mixture over crust in pan, sprinkle with remaining crust mixture. Bake at 350 for 30 min. Enjoy! One of these days, I’ll record a little scratch track and share it with you. It’s been rolling around my head this week as I look for the words to articulate what’s in my head. I’ve felt a little lost and unsettled regarding my fitness for a few months. I’ve been self aware enough to acknowledge that my body and mind need some recovery from intense training. I’ve had some really big amazing years of running and fitness. I’ve been full steam ahead since 2013. 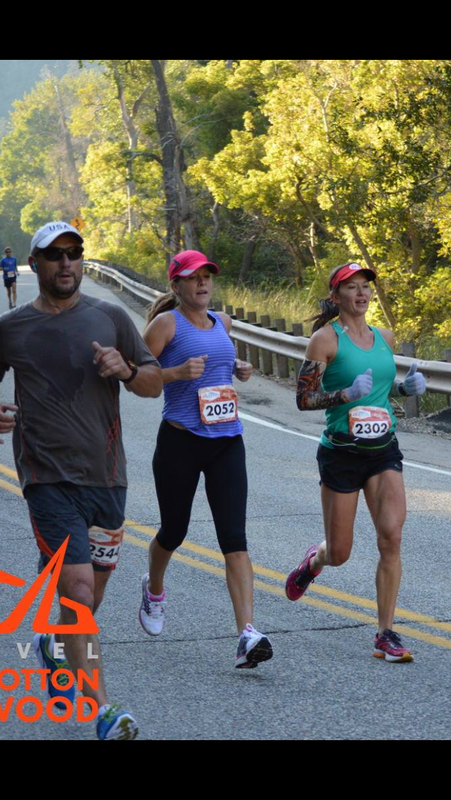 It finally caught up to me this past fall when I had a little breakdown mid-marathon at Big Cottonwood. Since then, I’ve been trying to allow myself some recovery while trying to maintain my fitness, rebalance my life with my family and my job(s) and figure out what’s next for me. When you’re in the mindset of pursuing big bad goals constantly, it’s more than a little unsettling to focus on pulling back instead. I have felt lost. Depressed, even. Depression led to exhaustion, lack of motivation and while I was still running and hitting the gym my heart just wasn’t in it anymore. I kept feeling like what’s the point if I’m not training to get faster or stronger? What I’ve learned is that it’s ok. It doesn’t haven’t to be about chasing PRs or losing 10 lbs, or getting a six pack or losing inches. Those are really awesome goals! But, fitness can be other things too. It can be about gaining energy, finding joy, reconnecting with the Spirit, overcoming trials, being healthy. For me, I find so much joy in running. I find the most freedom, answers to my worries when I just go by feel and fly. I feel amazing after a good lifting session where I can listen to my body and know my limits without thinking about the numbers. 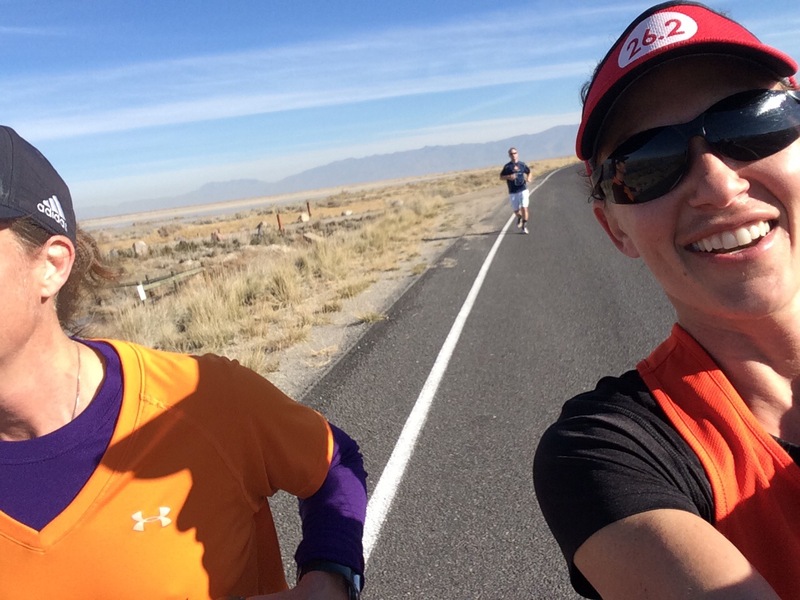 I can root from the sidelines for my friends who are chasing PRs and training for marathons, and be thrilled for them without training with them. I can encourage and motivate my clients at the gym without going all out in 5 days classes a day. I can feed my body healthy food because I’m craving it or because I’m aware of what it needs and I can eat ice cream guilt free because life is meant to be enjoyed. I am finally at peace with where I am in my fitness. Extra lbs, slower miles, shorter workouts. I’m happy here. For now. I love salads. I love getting creative and finding new thing to add to them. Particularly fruits and veggies that are in season. Lately, my favorite salad add-in has been grapefruit. I love, I mean, LOVE grapefruit! It’s my favorite of all the citrus fruits! It’s the perfect blend of sweet and sour. High in vitamin C, grapefruit not only boosts the immune system and increases energy, but it also have amazing far burning properties! Yes, grapefruit can boost your metabolism! So today, I added some of this yummy super fruit to my salad. And squeezing the juice over top makes an amazingly delicious low fat dressing! 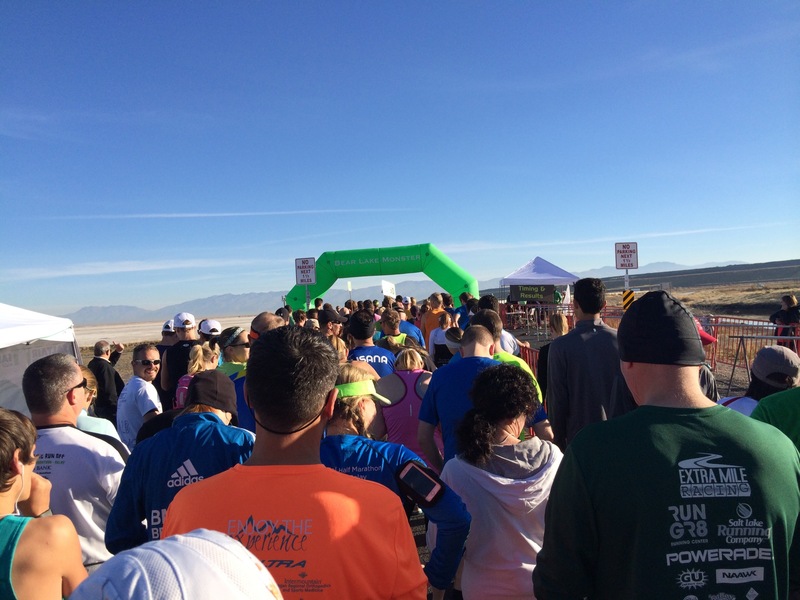 I had the pleasure of running the Saltair Half Marathon today as a pacer. 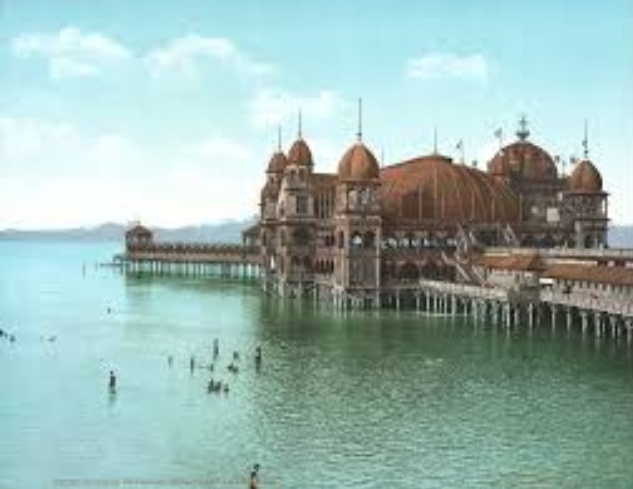 The race started and ended at Old Saltair. It’s kinda of beautiful building, in a creepy haunted sort of way. The course was a flat out and back, one I wouldn’t normally consider to be a fun route, but as a pacer, running for everyone else, getting to be a cheerleader, coach, motivator, not running for myself, that changes my perspective. It’s all about everyone else. And that is why I loved it. 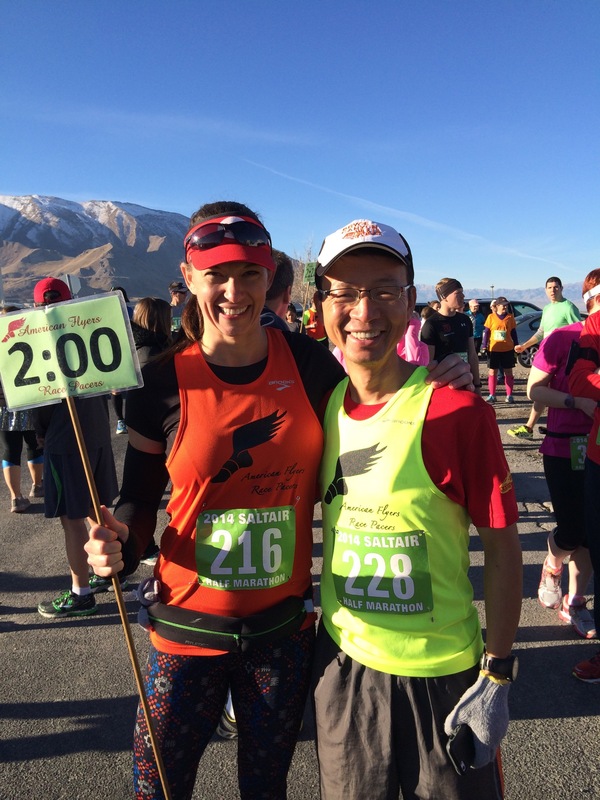 My racing partner, Wan Ho is one seriously amazing guy! One of the kindest, most positive people I’ve ever met! Never mind the fact that Wan showed up with a sprained ankle and I showed up with a strained hamstring. A little pain won’t slow down these pacers! 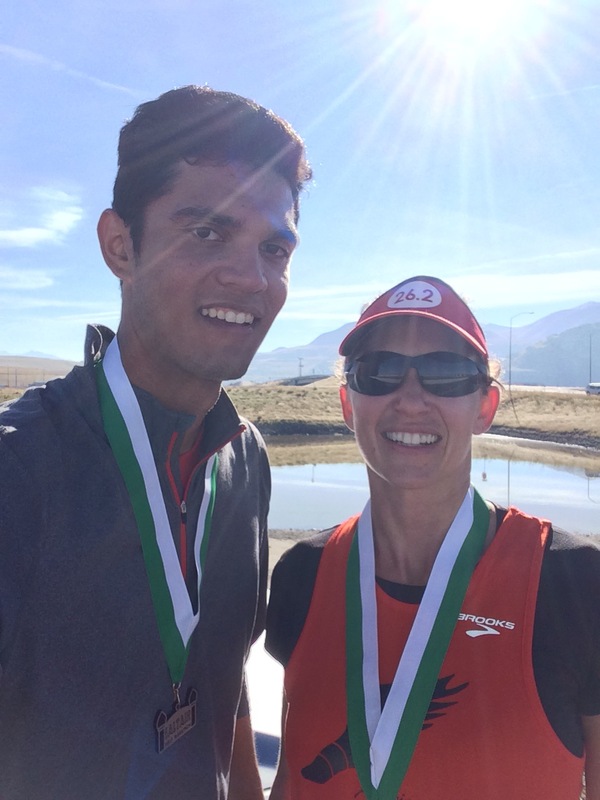 We were determined to get our people their goal time, pain or not! And he brought me my own little kit of Chinese miracle healer medicine for my leg. See what I mean? Nicest guy ever! 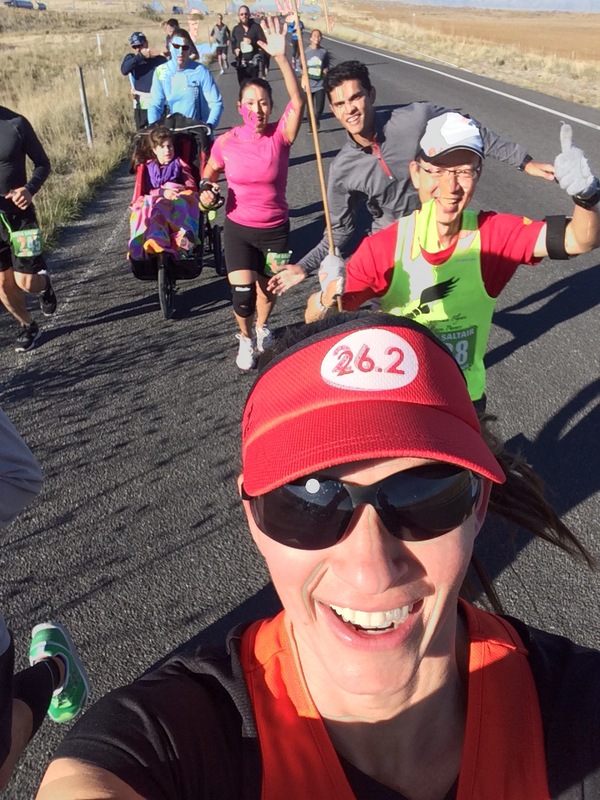 We met some awesome runners along the course. Some running their very first half marathon. 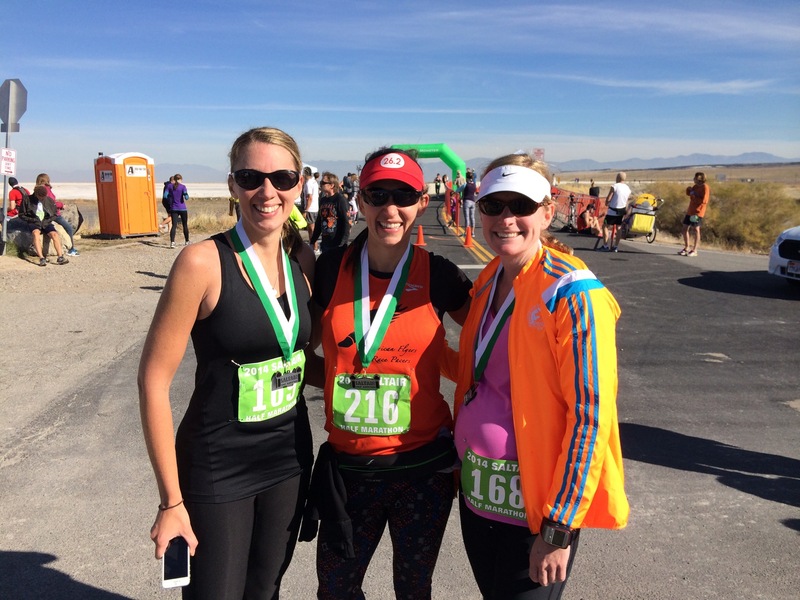 These are some of my favorite runners to meet on a course. They are green with the excitement of running and have so much energy and determination. The road of possibilities is stretched for many miles ahead of them. 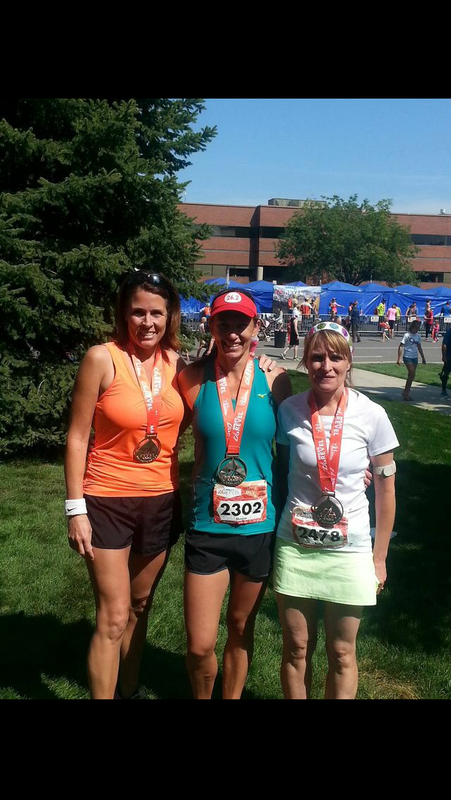 And equally inspiring are those I meet on the course that are running their 50th or 100th half marathon. True veterans of the sport, eager and willing to share their wisdom. It was just a day of grit, determination and inspiration. Ready to meet a few? Start line! Could it be that this many people love this running thing as much as I do? That’s me. Which way do we go? Our little group of 2 hr groupies. Sub 2 hours or bust!! A few miles later. Still smiling. Still running! Running and taking selfies is hard. Done! We did it! Finished! With Allison and Meridith. Allison is 28 weeks pregnant and smoked our little 2 hr group by a long shot. Simply amazing! Setting an example for preggos everything. One Bad A mother runner! I’m all about the grab and go pre-workout meal. Especially at 5:00 in the morning before a long run or a hard set at the gym. I have to eat before I workout. It’s important to fuel for energy before a hard workout. Heck, honestly, sometimes, I eat in the middle of my workout or run. Got to fuel that fat burning machine! My favorite go-to pre run or workout meal is a banana and a protein bar. And if you have used the store bought bars, you know that they are a) usually packed with artificial sweeteners or sugars and preservatives or b) they are super expensive. So I got tired of paying out my nose for something I could just make at home and be able to control what ingredients go into it. So, here is a recipe I adapted from one I found on the internet. 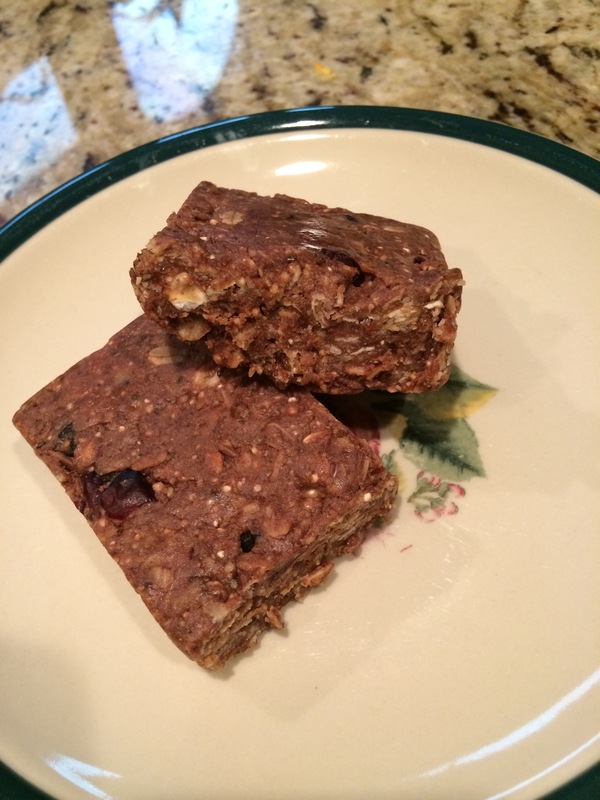 It’s super fast, super easy, no bake, all natural, and absolutely delicious! Even my kids like them (I have to hide them to keep for myself). There are a lot of variations you could try with the ingredients. I omit the Rice Krispies, or you could add different dried fruits, text for different flavors. In sauce pan or microwave heat nut butter and honey or syrup 30-60 sec, stir til smooth. Add vanilla. Pour liquid over dry ingredients, mix well. Pour mixture into 9 x 13 and press into pan. Using a large square of wax paper, very firmly press into pan. Allow to cool on cooling rack, refrigerate for 30 minutes. Cut into squares, wrap each square tightly with plastic wrap. Get it? Easy Caprese? Haha. I’m so funny! This was my lunch today. . So, divinely delicious! And packed with much needed protein, fat and veggies after my leg workout this morning. And it was so fast and easy to make! This is a must try, and has some of my very favorite foods. 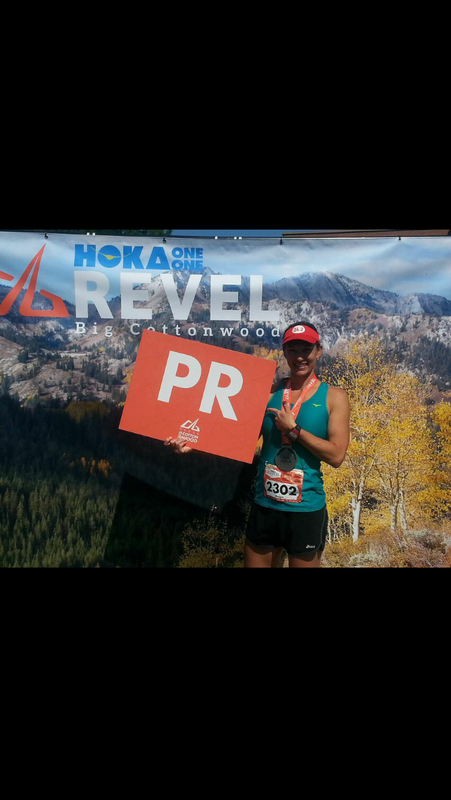 Two weeks ago, I ran the Big Cottonwood Marathon. This was my first time running this marathon. 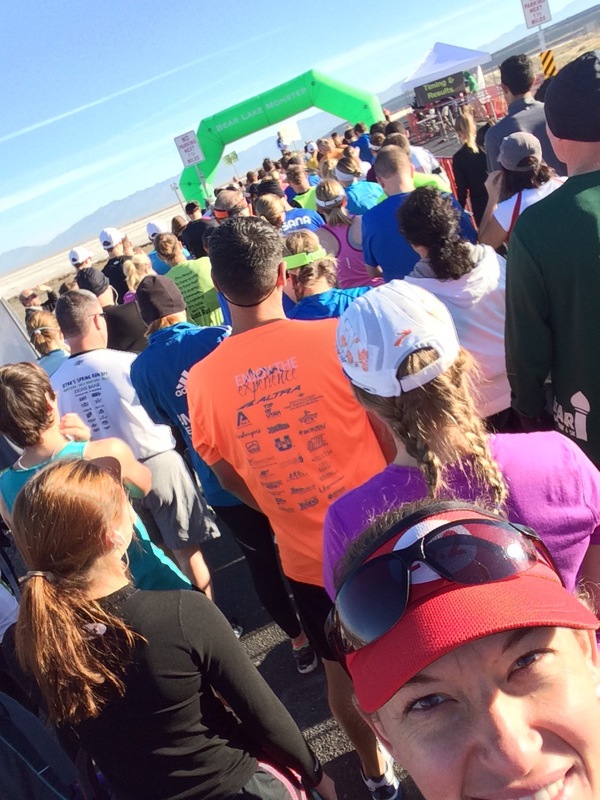 Last year, I ran the half and absolutely loved it! Beautiful scenery, nice downhill course, great company. I decided after such a good experience, I should go ahead and run the full the next year. And so, I registered for the full and began my training. I have always had the goal to qualify for Boston. Up to that point my running pace has been about a minute and a half too slow to qualify. Early this year, a series of things motivated me to give it a go and try to train for a faster time. I started pushing a little harder in my training runs, running intervals and sprints, and started hitting weights heavy and hard. The morning of September 13th, I woke up at an insane hour only runners and new mothers see on a regular basis, met up with my friends, Betty and Annette and sister Kathryn and brother Mason and loaded the school bus full of all the other crazy runners to ride up to the start. Freezing our toes off, we and all the other runners huddled together in our foil blankets, waiting for the race to start. Roughly half hour after the scheduled start time, the race finally began. Pacing alongside, Jolene, my sister’s neighbor, who had a similar time goal as mine, I weaved my way thru the other runners, warming up my legs, finding my rhythm. 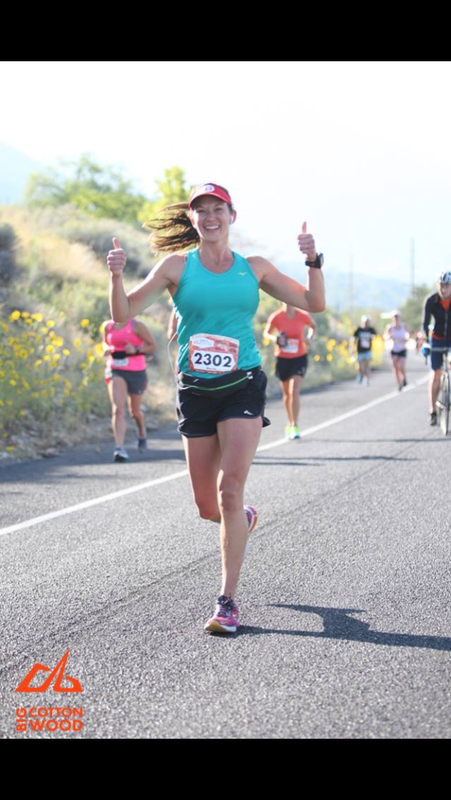 Riding the adrenaline of race day, soaking in the excitement of my fellow runners, and floating on the gravity of the canyon, I picked up speed, letting the hill carry me across the miles. At about mile 4, I had warmed up so decided to shed my long sleeve shirt. In the process, my ear buds fell behind my back. I asked Jolene, who was still pacing beside me, to help me grab it. As we both ran along, focusing on my earbuds, Jolene ran over a traffic cone and fell down hard, slamming her knee on the pavement. As I helped her up and to the side of the road, I was overcome with feelings of guilt. 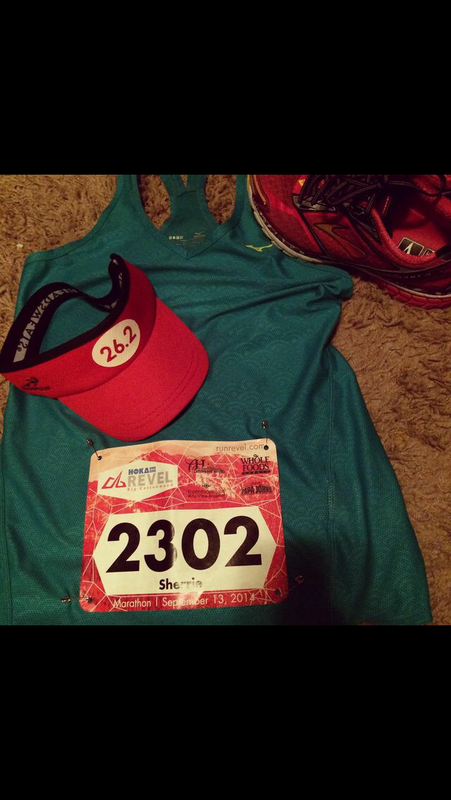 Jolene had already had one failed attempt at qualifying for Boston and this was her second chance. And I had potentially cost her her shot. After making sure she was ok, Jolene insisted I keep going. Reluctantly, I went on my way, stopping briefly at the next aid station for a pit stop. Concerned about my potty break costing me precious minutes, I sped up down the canyon, passing a few familiar faces as I went. Eventually, I caught up with Jolene again. Thankful to see she was ok and still running, I paced alongside her again. We ran together all the way down the canyon. At the bottom of the canyon, about mile 15, I stopped quickly to take a swig of my energy drink I had stashed, turned the corner, as the course changed from smooth downhill, to rolling ups and downs, and surged forward. The change of terrain was a nice break on my muscles after the long down hill. 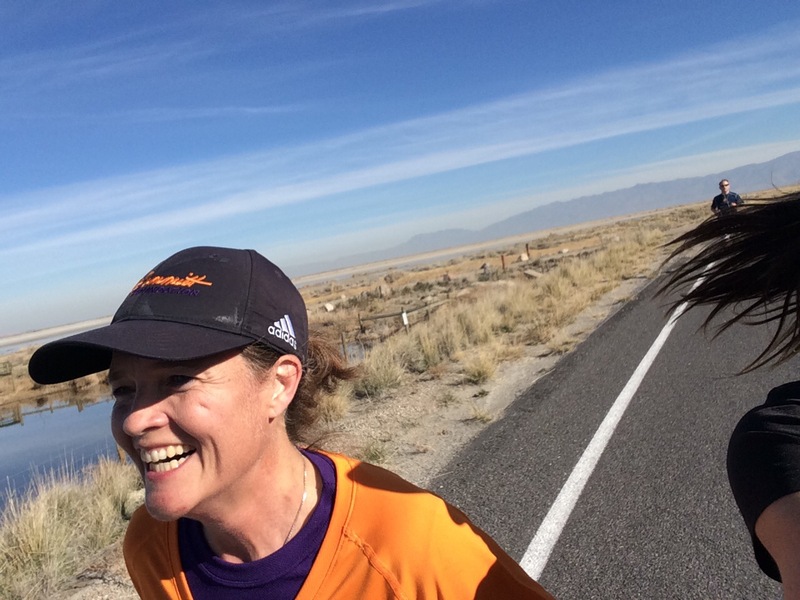 About mile 16, trudging uphill, Jolene urged me onward, as she slowed for a walk break. I was still feeling good so I kept going. 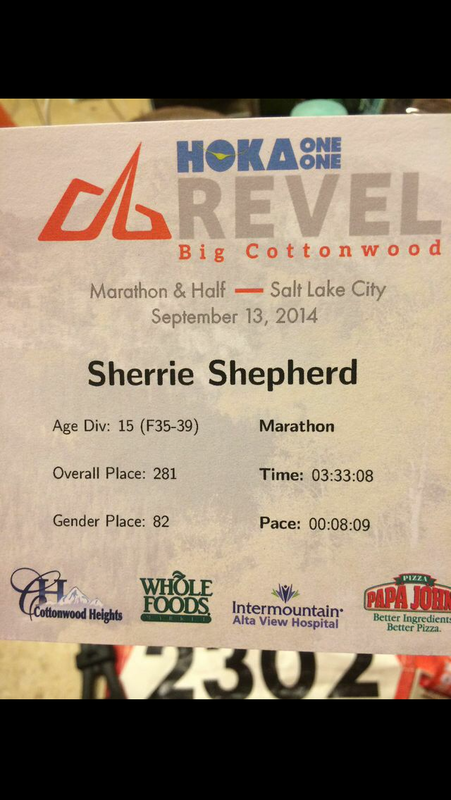 I had worried that the out and back part of the course on Wasatch blvd. would be demoralizing, but it was fun to see so many of my friends pass by as they ran ahead of me along the course. About a mile before the turn-around point, around mile 18, the uphill started getting steeper and seeing that giant sign up in the distance, I started to hit a wall. That was the longest, hardest mile of the race. I thought I’d never get there. But I powered forward, promising myself a walk break at the top. Finally, I reached mile 19 and the turn around point. Little did I know, it wasn’t all downhill. The rolling up and down I had just experienced was meant to be repeated. I was exhausted. My legs ached. My feet ached. Putting one foot in front of the other took every ounce of strength and will power I had. I made it to the next aid station, took some GU and water as the 3:35 pacer passed by me. I had to keep up! I just had to! So, again, I pressed forward, watching as the distance between me and my goal time grew farther away. Push!, I told myself. Keep going! Mile 22. 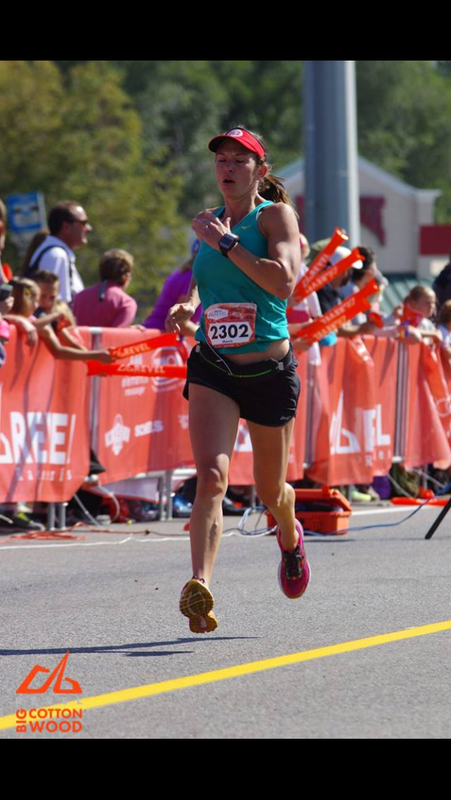 This is that moment, in every marathon I have ever run, that moment when I have to dig as deep into my soul as I can, and find the strength, courage and will power to endure to the end. I prayed. I cried. I tried to maintain my breathing rhythm as I choked on my raw emotions. Overcoming my discouragement, I rounded that last corner. The course turned again down hill. Only three miles to go. Frustration and fear gave way to gratitude and hope. No matter the end result, I felt such an overwhelming sense of gratitude for what my body was able to do. It’s not the first time and certainly won’t be the last, that I have been overcome with thanks for my Creator for blessing me with this body that is healthy and strong and can perform what I ask it to do. 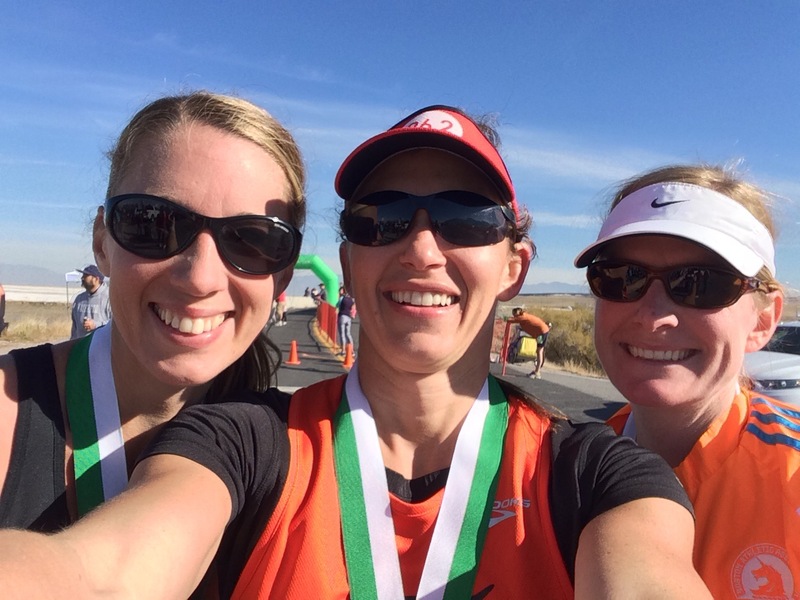 Running 26.2 miles is so, incredibly hard. And once again, for the 8th time in my life, I was able to do it. Adrenaline, endorphins and probably a few angels carried me through those last few miles. 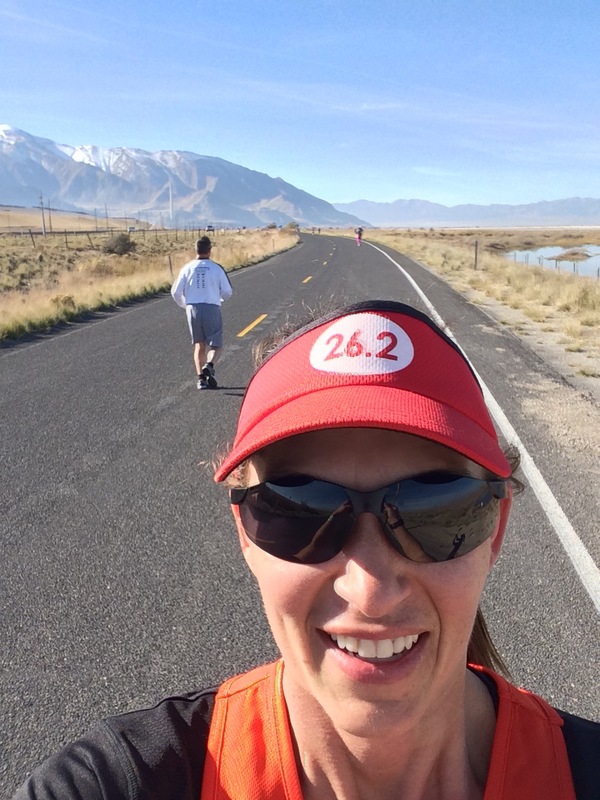 As I neared mile 26, I dug deep and surged forward, and sprinted that last quarter mile. Finishing just seconds behind my target pacer, I crossed the finish line with a clock time of 3:35:56. I had done it! I made it! And I QUALIFIED FOR BOSTON! 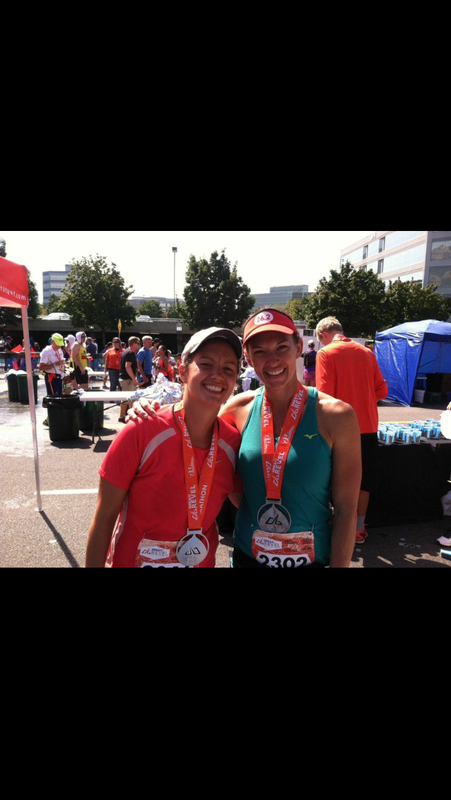 Tears, sweat, pain, grit, love, exhaustion, elation. Just a few of the things I was feeling as I hobbled around the finisher’s square. After waiting for my friends and sister and brother to come across the finish, eating, drinking, I walked to the timing table to get my official time printout. Official chip time was 3:33:08! I have never been more sore after a race as this one, I experienced a slight injury in my foot from the steep terrain, but it was so worth it! In our family, we have eggs for dinner. A lot. With 2 kids playing soccer, Mom and Dad killing it in the gym, and training for marathons and all the growing monkeys, we all need our protein. I’m always trying to find new ways to mix it up. This time of year, a lot of yummy veggies are getting ready to harvest in our home gardens. Or, if you’re like me, and always intended to get around to planting, but never got to it, the local Farmer’s Market has ’em! There is not much better than fresh picked, fresh made home made salsa! Why not throw it in ranch style and make an omelet?! The best news is it’s super fast and easy! Chop all the veggies, and mix in a small bowl or throw them all together in the food processor. Add salt, pepper and garlic to taste. 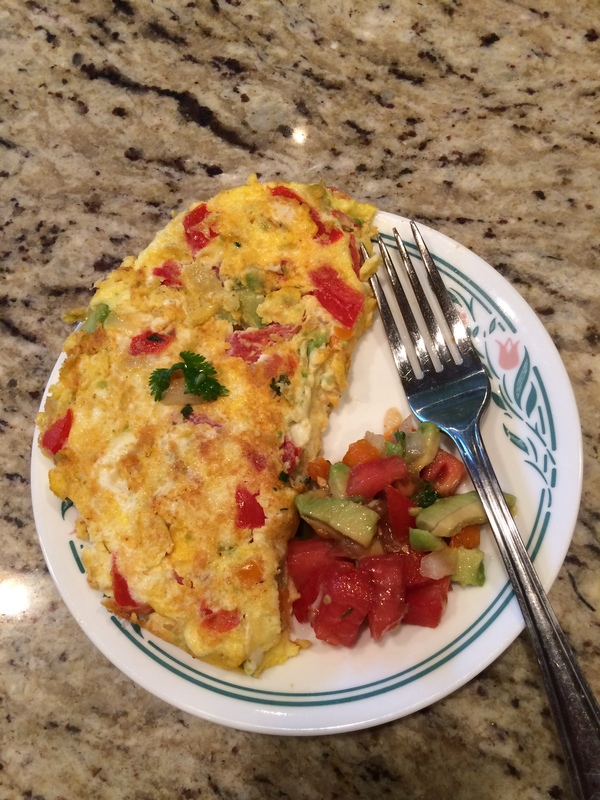 Put olive oil in hot omelet pan or frying pan. Sprinkle desired amount of salsa into pan, and stir fry for about 1 min. Crack eggs into separate bowl, whisk, and then pour over salsa in pan. Cook until under side is nice and golden, and omelet easily slides side to side, about 1-1/2 min. Flip and sprinkle cheese on top. Fold in half, cook til cheese melts, about 30 sec – 1 min. Serve with a side of fresh salsa. Goes great with a side of whole wheat toast, or even as a egg sandwich!